X It is said to deliver happiness. Being compassionate, it shares its eggs with injured people. X Il est censé apporter la joie. Ce Pokémon charitable offre ses œufs aux blessés. X Se dice que reparte felicidad. Se caracteriza por su compasión y reparte sus huevos entre la gente herida. X Si dice che porti felicità. È molto altruista e condivide le uova con chi è ferito. X 행복을 가져다준다고 전해진다. 상처 입은 사람에게 알을 나눠주는 상냥한 포켓몬이다. Y It lays several eggs a day. The eggs are apparently rich in nutrients and extremely delicious. Y Il peut pondre plusieurs œufs par jour. Ses œufs sont très riches en nutriments et vraiment délicieux. Y Pone varios huevos al día. Según parece son muy nutritivos y están riquísimos. Y Ogni giorno depone diverse uova, che sembrano essere deliziose e molto nutrienti. Y 하루에 몇 개의 알을 낳는다. 그 알은 영양 만점으로 굉장히 맛있다고 한다. Omega Ruby Chansey lays nutritionally excellent eggs on an everyday basis. The eggs are so delicious, they are easily and eagerly devoured by even those people who have lost their appetite. Omega Ruby Chaneira legt täglich ausgesprochen nahrhafte Eier. Sie sind so köstlich, dass sie sogar von Menschen verspeist werden, die gar keinen Appetit haben. Omega Ruby Leveinard pond tous les jours des œufs pleins de vitamines. Ces œufs sont tellement bons que les gens les mangent même quand ils n’ont pas faim. Omega Ruby Chansey pone a diario huevos con un valor nutritivo altísimo. Están tan ricos que hasta quien no tenga hambre se los comerá en un abrir y cerrar de ojos. 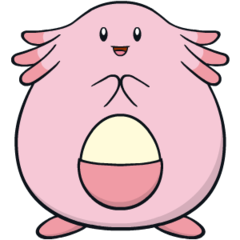 Omega Ruby Ogni giorno Chansey depone uova molto nutrienti. Queste uova sono così buone da far tornare l’appetito a chi lo ha perso. Omega Ruby 영양 만점인 알을 매일 낳는다. 식욕을 잃은 사람도 한 번에 먹어치울 정도로 맛있는 알이다. Alpha Sapphire Chansey lays nutritionally excellent eggs on an everyday basis. The eggs are so delicious, they are easily and eagerly devoured by even those people who have lost their appetite. Alpha Sapphire Chaneira legt täglich ausgesprochen nahrhafte Eier. Sie sind so köstlich, dass sie sogar von Menschen verspeist werden, die gar keinen Appetit haben. Alpha Sapphire Leveinard pond tous les jours des œufs pleins de vitamines. Ces œufs sont tellement bons que les gens les mangent même quand ils n’ont pas faim. Alpha Sapphire Chansey pone a diario huevos con un valor nutritivo altísimo. Están tan ricos que hasta quien no tenga hambre se los comerá en un abrir y cerrar de ojos. 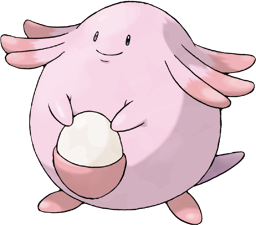 Alpha Sapphire Ogni giorno Chansey depone uova molto nutrienti. Queste uova sono così buone da far tornare l’appetito a chi lo ha perso. Alpha Sapphire 영양 만점인 알을 매일 낳는다. 식욕을 잃은 사람도 한 번에 먹어치울 정도로 맛있는 알이다. Sun The eggs laid by Chansey are rich in nutrients and a favorite food of many Pokémon. Moon Not only are these Pokémon fast runners, they’re also few in number, so anyone who finds one must be lucky indeed. Red A rare and elusive Pokemon that is said to bring happiness to those who manage to get it. Blue A rare and elusive Pokemon that is said to bring happiness to those who manage to get it. Yellow A gentle kind hearted Pokemon that shares its nutritious eggs if it sees an injured Pokemon. Stadium Lays very succulent eggs every day. If it is treated with love and care, its eggs appear to become even more delicious. Gold It walks carefully to prevent its egg from breaking. However, it is extremely fast at running away. Silver Few in number and difficult to capture, it is said to bring happiness to the trainer who catches it. Stadium2 It walks carefully to prevent its egg from breaking. However, it is extremely fast at running away. Ruby Chansey lays nutritionally excellent eggs on an everyday basis. The eggs are so delicious, they are easily and eagerly devoured by even those people who have lost their appetite. Sapphire CHANSEY lays nutritionally excellent eggs on an everyday basis. The eggs are so delicious, they are easily and eagerly devoured by even those people who have lost their appetite. Emerald CHANSEY lay nutritionally excellent eggs every day. The eggs are so delicious, they are eagerly devoured by even those people who have lost their appetite. Pearl It lays several eggs a day and won't share them with those who have evil in their hearts. Platinum A kindly Pokemon that lays highly nutritious eggs and shares them with injured Pokemon or people. Black A kindly Pokémon that lays highly nutritious eggs and shares them with injured Pokémon or people. White A kindly Pokémon that lays highly nutritious eggs and shares them with injured Pokémon or people. Black 2 A kindly Pokémon that lays highly nutritious eggs and shares them with injured Pokémon or people. White 2 A kindly Pokémon that lays highly nutritious eggs and shares them with injured Pokémon or people.